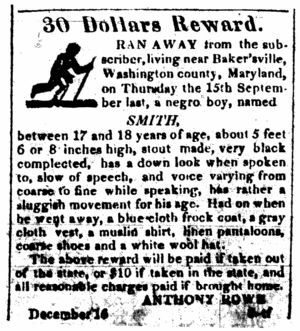 between 17 and 18 years of age, about 5 feet 6 or 8 inches high, stout made, very black complected, has a down look when spoken to, slow of speech, and voice varying from coarse to fine while speaking, has rather a sluggish movement for his age. Had on when he went away, a blue cloth frock coat, a gray cloth vest, a muslin shirt, then pantaloons, coarse shoes and a white wool hat. The above reward will be paid if taken out of the state or $10 if taken in the state, and all reasonable charges paid if brought home.